The mayor of Mora, Aldros Cierza, is seized by the Inquisition. He was publicly executed soon afterward for turning against the Emperor. TURN SIX: The death of the Tau Emissary was unfortunate, but there was still one member of the Water Caste—an assistant to the Tau agitator—who needed to be seized. Having crushed the Kroot battle line, the Knights of Altair raced across the field, but the Tau had too much of a head start. 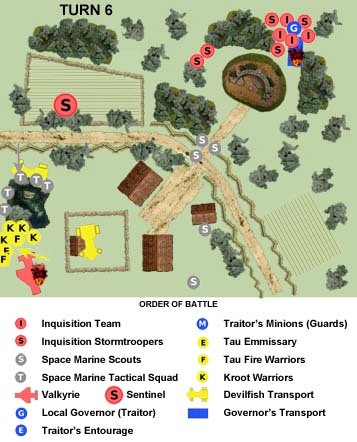 The second Emissary disappeared into the heavy forests to the southeast, and although the Knights followed, the woods were the natural ground of the Tau’s avian auxiliaries, and while the xenos died almost to a creature, their fighting prowess was improved in the woods, and this slowed the Space Marines. The second Emissary had escaped. I am disappointed in Approbator Drusus. The killing of the Tau Emissary, and the escape of the lower-ranked xeno target, has deprived me of a potentially powerful source of intelligence on the Tau’s intentions. Either member of the Water Caste would have, after proper motivation, provided a list of Tau operatives and traitorous citizens. The capture of Mayor Cierza, however, was a more satisfactory result. The mayor’s entourage and personal guard were killed efficiently, and Cierza was seized relatively unharmed. His capture led to a pogrom against all traitors in the area, and his subsequent public execution was a powerful reminder to all would-be traitors that service to the Emperor is everything—and anything less will be punished severely. Postscript: Based on Cierza’s confession, it was revealed that five senior members of the family that owned the Mora plantation had conspired with Cierza to keep the war out of the town. These traitors also were executed. With Imperial resources spread thing, it was decided that revoking the family claim to the plantation was inefficient. This just isn’t the time for members of the Administratum to stretch their resources to rule directly. An appropriate member of the family was selected and assumed control of Mora, and after the example set with his older, now deceased, cousins, I have little doubt he will think twice—and then a third and fourth time—before conspiring against the Imperium. TheGM: This was a fun little scenario to play, with lots of drama. The crash of the Valkyrie to block the escape of the Tau Emissary was an amusing, if desperate, tactic that was much appreciated by the players. It added some drama and “atmosphere” to the evening’s entertainment. It’s also nice to see my Knights of Altair on the tabletop. After seven months, it’s about time …. Click here to return to Part 1 — or click here to go back to Part 2.